Since the advent of astronomical CCD imaging it has been possible for amateurs to produce images of a quality that was attainable only by universities and professional observatories just a decade ago. However, astronomical CCD cameras are still very expensive, and technology has now progressed so that digital cameras – the kind you use on holiday – are more than capable of photographing the brighter astronomical objects, notably the Moon and major planets. Tony Buick has worked for two years on the techniques involved, and has written this illustrated step-by-step manual for anyone who has a telescope (of any size) and a digital camera. The color images he has produced – there are over 300 of them in the book – are of breathtaking quality. 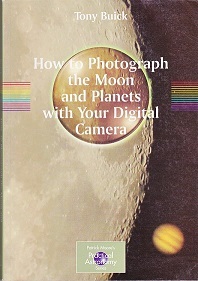 His book is more than a manual of techniques (including details of how to make a low-cost DIY camera mount) and examples; it also provides a concise photographic atlas of the whole of the nearside of the Moon – with every image made using a standard digital camera – and describes the various lunar features, including the sites of manned and robotic landings.